Welcome to Pure Curtis Cabins. We offer three wonderful Upper Michigan Lake Front Cabin Rentals located in the beautiful fishing and art community of Curtis, MI. Our Upper Michigan cabin rentals are situated along South Manistique Lake. Guests can expect a truly tranquil water filled vacation. We offer three great seasons of recreational opportunities. Please visit our Activities page to learn more. We know that your experience will be "Purely Refreshing". 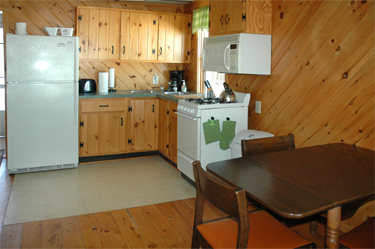 Our three Curtis, MI Cabin Rentals have plenty of great amenities for our guests to enjoy. There decor has a great Upper Michigan feel along with all the comforts of home. Each of our cabins have its own unique layout and character. 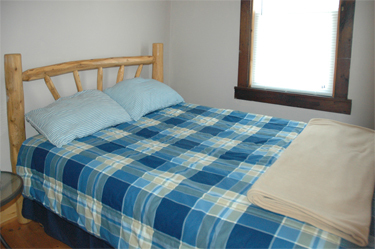 Our Curtis, MI Cabin Rentals are very clean and are situated peacefully along South Manistique Lake. There are many other great amenities to browse here at Pure Curtis Cabins. Please visit our Accommodations page for more information. A 14ft aluminum boat and canoe is inclusive with your Pure Curtis Cabins rental. We have also installed a new dock for our fishermen (shown here). 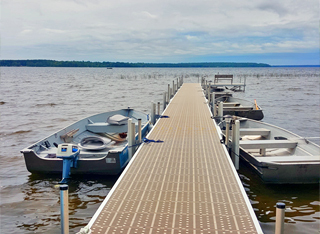 We encourage all our guests to experience their adventure here on South Manistique Lake. This lake is comprised of 4001 acres and offers a variety of fish species for the sportsman: Largemouth Bass, Northern Pike, Smallmouth Bass, Walleye, Yellow Perch, Cisco, Bluegill, Sunfish, Muskie, Whitefish. Please visit our Accommodations page for more information on our amenities. We are located along beautiful South Manistique Lake. 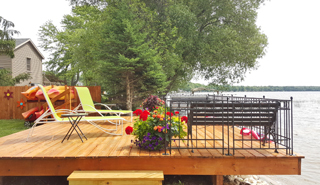 We have a common deck (shown here) overlooking this scenic body of water. We are situated near the Erickson Center for the Arts (within a block), Seney Wildlife Refuge, Pictured Rocks National Lakeshore, Tahquamenon Falls, Oswald's Bear Ranch, Whitefish Point Bird Observatory, The Great Lakes Shipwreck Museum, along with many natural attractions like the Black River Flooding and our lakes - Upper Michigan's Largest Lake Complex. Guests can also enjoy our close proximity to the following: groceries, gas, lounges, restaurants, party stores, and www.chamberlinsinn.com.